The best dark chocolate on the planet…. Could this be the best dark chocolate on the face of the earth? Quite possibly. I’m a big dark chocolate fan. BIG. And this baby really deserved a share…..not JUST because quinoa rocks my undies, but because it tastes amazing and it IS Easter! As with most organic or good quality chocolate, it’s doesn’t come cheap. $6 for 80g might be enough to make you think you’ll be going back to ye ol’ trusty “4 buck Lindt” – but once you’ve tasted it, the cost will be instantly justified! If you’ve ever had a ‘Crunch’ bar you’ll know what to expect with regard to the quinoa rice crisps in this chocolate. Mmmm mm! It’s organic, fair trade and made without any nasty emulsifiers or GMO products. Can’t wait to get more of this into my belly! Pick up a block if you see it! 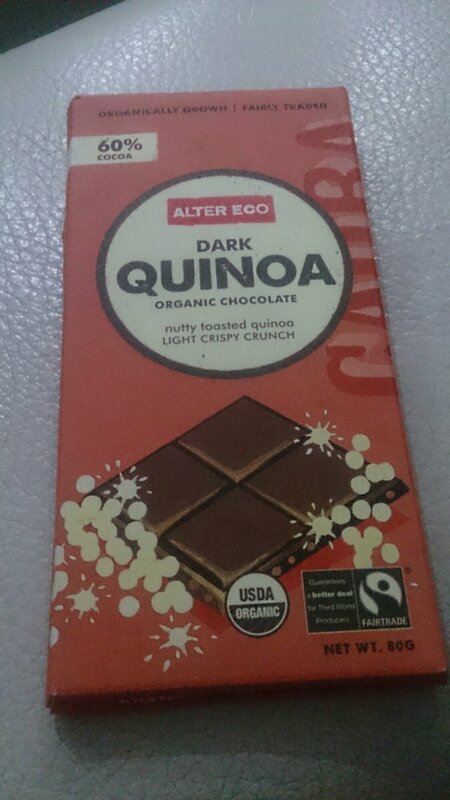 This entry was tagged altereco, chocolate, GMOfree, organic, quinoa. Bookmark the permalink. ← Sunday Fish Delish! North African Salmon….